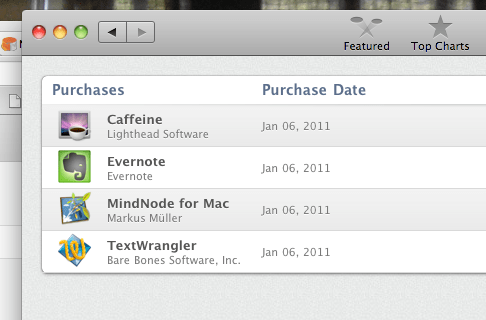 Apple today launched their “Mac App Store”, something I must admit I didn’t fully “get’ at first. Originally I assumed it was simply a dashboard-like interface for easily porting iOS apps to OS X. It’s not, it’s far from it. It’s actually solving one of the biggest problems plaguing “typical” computer users – downloaded and installing software. This conversation should sound familiar to anyone under the age of 40 who has parents who use computers. Me: did you try out [[[SOFTWARE]]] yet? Parent: I couldn’t get it to work. Me: huh, why not? it’s pretty simple to use. Parent: I don’t know, it’s just not on the computer, I don’t know why. Me: did you install it? Me: okay, so what’s the problem? Parent: Not sure, after I went to their website I never could get it to open. Parent: It always tells me its installing. Me: so you ran the installer? Me: so what’s the problem?? Parent: I have no idea, fix it next time you come over. How are the kids? The reality of the world is tons of folks are downloading, but the successful installation and execution of software on computers is an utter mess. And yes, even on OS X it’s a mess – why would I want to drag into the Applications folder? Why isn’t that automatically done? How do things get in the dock? Etc. The App store fixes all of this, and fixes it well. With the latest OS X upgrade, the App Store appears in the dock automatically. Upon launching the user is required to sign in to their Apple account (probably the worst part of the experience, as it should just pull in iTunes account info), then they can download/install/run new software as effortlessly as they can on an iPhone/iPad. 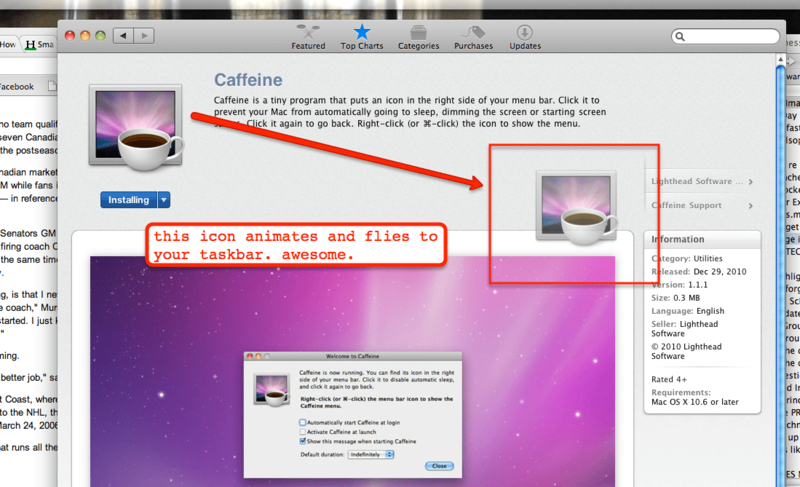 The new app automatically installs and adds itself to the dock – that’s it. One other “oh, sweet” moments I had while perusing the App Store? No, it wasn’t Angry Birds (seriously, yawn much? it’s an okay game, but it’s time to move on. it’s like after they started airing “Who Wants to be a Millionaire?” seven nights a week!). 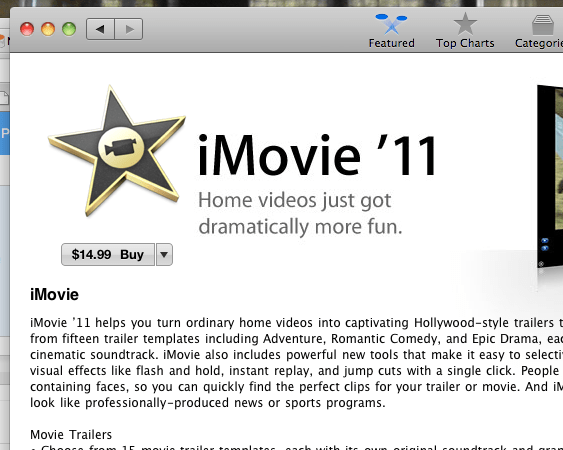 It was finding iMovie ’11 available for individual purchase. This is another important move, as Apple is unlocking the previously bundled iLife (and iWork) suites. Perfect for folks like me who like the features of one ’11 app but not the other (in my case – I don’t want iPhoto ’11 yet). This creates a lot of opportunity not just for Apple, but for other software vendors seeking to “break up” packages and make incremental additional revenue from the extras. It’s not perfect, by any means. There’s still no solid UNinstall, which is a big missing part (try AppZapper – thanks @MG!). For example, I can’t sort by Ratings, there’s no ability to preview apps, etc. The store is so simple that at times it truly feels simplistic. Some categories seem odd (does weather need a whole category?) and others completely under-developed (games? one category for ALL games?). I’d also like to see screenshots get replaced with screenflows/video demos. But that’s about the entirety to my complaints at this time, and that ain’t bad all things considered. Since the original dot-com explosion, the tech industry in general has avoided new consumer-facing software like the plague. Half (or quarter) baked Web ideas or apps get funding out the wazoo, but tell an investor that there’s downloaded software involved (worse yet – a plug-in), and they run for the hills (well, not really, since they’re probably on Sand Hill already, but that’s just a weird wording thing). It’s funny that we’ve needed the success of the mobile app market to revitalize the “old fashioned” software market, but that’s exactly what the Mac App store is going to do. If there’s one thing we can truly say the App store “killed” today, it’s the traditional installer. And rest in peace, but you won’t be missed.